Exposure to harsh chemicals, acids, oil, coolant, etc. An Epoxy Primer. The first step of any long-lasting concrete floor coating is the primer – as concrete is naturally porous, the primer prevents subsequent layers from absorbing into the concrete’s surface. We use a multipurpose epoxy to prime the concrete slab for installation. An Epoxy Seed Coat with Sand Broadcast. A broadcast of silica sand is included in this layer of multipurpose epoxy, to add strength and volume. The sand increases the system’s ability to withstand heavy loads and traffic, while providing a textured surface. An Epoxy Grout Layer. Next, another layer of epoxy seals the sand broadcast for added strength and volume. 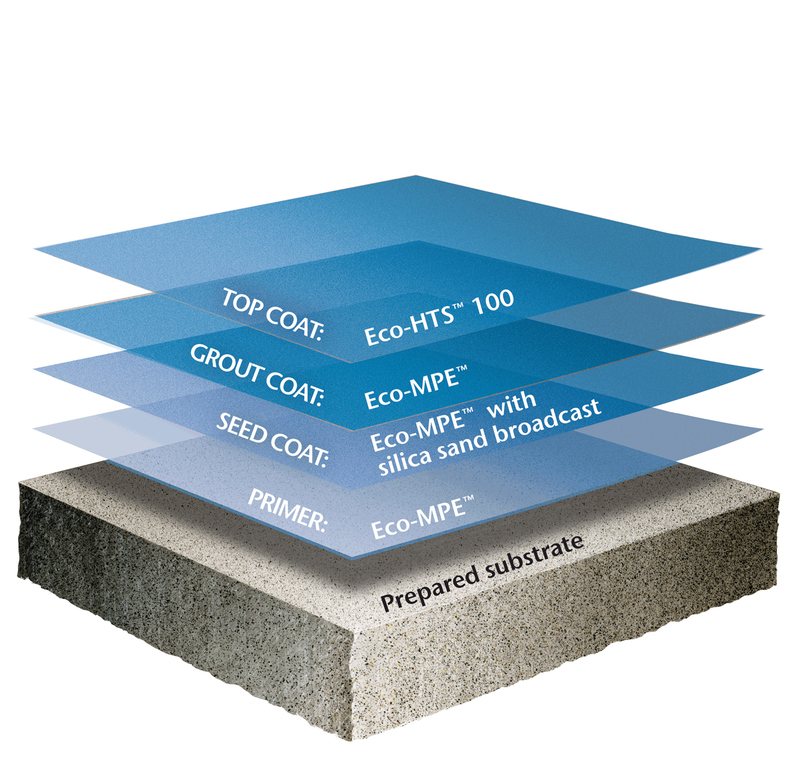 An Eco-HTS™ 100 Topcoat. Finally, a topcoat is installed to maintain a fresh satin finish, enhance slip resistance, and protect the system against chemicals. This topcoat is also aliphatic, giving it an advantage in light stability over its aromatic counterparts. In addition to its exceptional strength and durability, Eco-ShopFloor™ is a low odor option with low levels of volatile organic compounds (VOCs), which are organic compounds that can easily become gaseous and emit into the air. In addition to causing an odor, VOCs can be hazardous to human health: prolonged exposure may result in throat irritation, headaches, nausea, and damage to internal organs. While VOCs are used to make up a huge portion of paints and floor coatings, Tennant Coatings is proud to offer safe options like Eco-ShopFloor™ that are low odor and low VOC. Tennant Company has been trusted in the world of flooring for years, although it is typically known for its innovative and reliable floor-cleaning solutions. Most people may not know that Tennant has also been manufacturing resinous floor coatings for just as long, with the same level of quality and care associated with our floor cleaning equipment. Unsure which floor coating might be best for your industrial or commercial facility? Our flooring experts are on hand to discuss your options and find the best solution for you. Contact us today to see how we can help!